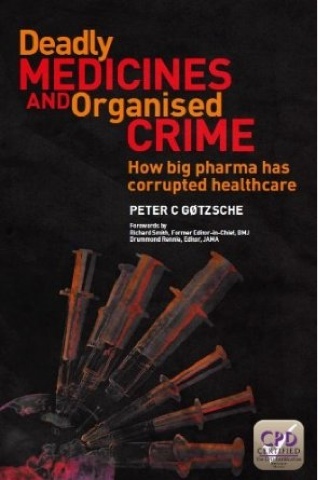 In his latest ground-breaking book, Peter C Gøtzsche exposes the pharmaceutical industries and their charade of fraudulent behavior, both in research and marketing where the morally repugnant disregard for human lives is the norm 1. He convincingly draws close comparisons with the tobacco conglomerates, revealing the extraordinary truth behind efforts to confuse and distract the public and their politicians. Peter is Director of The Nordic Cochrane Centre. Peter has published more than 50 papers in ”the big five” (BMJ, Lancet, JAMA, Ann Intern Med and N Engl J Med) and his scientific works have been cited over 9,000 times. He is author of Rational Diagnosis and Treatment. Evidence-Based Clinical Decision-Making (2007) and Mammography Screening: truth, lies and controversy (2012). Peter has an interest in statistics and research methodology. He is a member of several groups publishing guidelines for good reporting of research and has co-authored CONSORT for randomised trials (www.consort-statement.org), STROBE for observational studies (www.strobe-statement.org), PRISMA for systematic reviews and meta-analyses (www.prisma-statement.org), and SPIRIT for trial protocols (http://www.equator-network.org). Peter is an editor in the Cochrane Methodology Review Group.